This is the large print, hardback edition of Talking God. Thorndike press published both a hardback and paperback large print edition in 1989. The covers for both the hardback and paperback are the same. 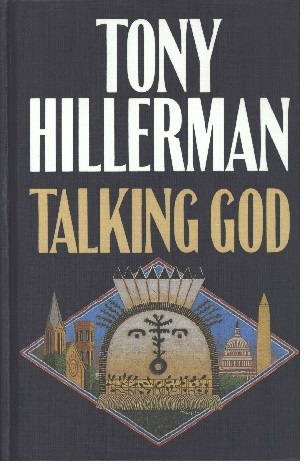 Additionally, the covers replicate the first edition dust jacket for Talking God created by Peter Thorpe, Hillerman's long-time graphic collaborator. Talking God is the ninth book in Tony Hillerman's Navajo Mystery Series and, unlike many Hillerman novels, a great deal of the book takes place in Washington DC rather than in the Southwest. Format: Hardback, 22.1 x 14.5 cm. Binding: Blue paper covered boards with a full color illustration on the front cover. The back cover has a summary of the novel, a brief biography of Tony Hillerman, followed by "Thorndike Large Print | Distributed in the U.K. and Commonwealth by | MAGNA PRINT BOOKS, England."